Should Authors Have a Persona? 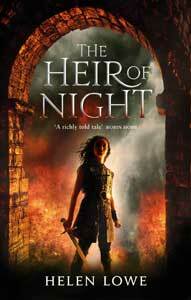 Get It While It’s Smokin’ Hot: “The Heir Of Night is a Kindle Monthly Deal for September! Late to the Show, But — Saw “Moana”, Loved It! We’re In the Final Countdown — But Things Are Still Happening! Blogging for Over Six Years — Who Would’ve Thought? Mothers as Main Characters In SFF — How Do I Count Them? Hello, 2016 — & Daughter Of Blood! Was There A Golden Age of Arthurian Fantasy? What’s the best thing about living in New Zealand? Celebrating NZ Speculative Fiction For #NZBookMonthMay: Wrapping Up Week 4 & The Month! Oops, no Monday post yet — how can that be? But here’s a photo! A Last Observation On Mary Stewart’s “Madam, Will You Talk”: So What Does Date It, Then? My Year In Retrospect — On The Supernatural Underground Now! Inside Middle Earth: Guess Where? Reminders: AKA It All Ends 30 September! A Writers’ Tea Party, 8 September — & More Frankie McMillan! Women Write Science Fiction: Yes, We Do! On Blogging & The Interrelationship With Writing–Or, Is Blogging A Marketing Tool? New Zealand National Flash Fiction Day Is Happening Again—And There’s A Contest! A Red Letter Day: I Have Upgraded My Website! I’ve Seen “The Hobbit”—Yes, I Have! It’s Aotearoa-New Zealand Speculative Fiction Blogging Week! Hmm, I Wonder, Am I Really Right About Space Opera? Reddit Fantasy AMA With Robin Hobb: What A Blast! My Reddit ‘AMA’ Q&A with Robin Hobb Is On Today! Hachette NZ is Giving Away An ARC of 2312 by Kim Stanley Robinson! Ringing In The New: I’m Now On Twitter! Happy Birthday to ” … on Anything, Really”: 1 Year Old Today—Plus Grand Birthday Giveaway Begins! Is There A Distinctively New Zealand Speculative Fiction? Milestone: 250 Posts Reached—& Now Passed! The Seagull: Portrait of the Artist?